Though the City of Long Beach did not hold any elections Tuesday, voters in both Signal Hill and nearby Los Angeles took to the polls to make important decisions about their local leaders–the results of which could eventually affect Long Beach. Two of Signal Hill’s three City Councilmembers up for re-election appeared to be maintaining their seats in the five-person council as of late Tuesday night, however that could change on Friday when as many as 176 provisional ballots are finally added to the tallies. “Those ballots could change the results of the entire election,” said the Signall Hill Tribune newspaper in its early-morning reporting today. 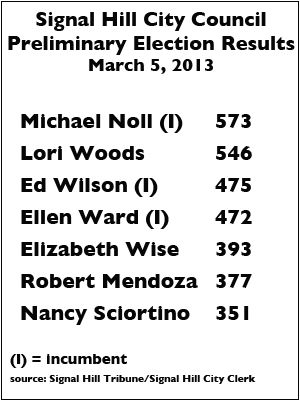 After issues with the ballot-counting machine which was providing numbers different from hand-count verifications (a worker came in to replace the machine), Signal Hill’s City Clerk released unofficial final numbers that showed–with all three of the City’s precints reporting and the provisional ballots yet to be counted–Current Vice Mayor and Councilmember Michael Noll in the lead followed by Lori Woods and then Councilmember Ed Wilson. Councilmember Ellen Ward was in fourth place by only three votes, but could be booted out of her seat if the current standings remain unchanged. 1164 total ballots were cast Tuesday out of the 11,000 people that live in the city, which is completely surrounded by Long Beach. Complete election results are below. In Los Angeles, the winners of the primary elections in the city’s contested mayoral race was a little more defined with voters narrowing down the candidates Tuesday from five to two with City Councilmember Eric Garcetti and Controller Wendy Greuel coming out on top. The two will move on to the general election to be held on May 21, which will decide who replaces current Mayor Antonio Villaraigosa when he terms out in July. 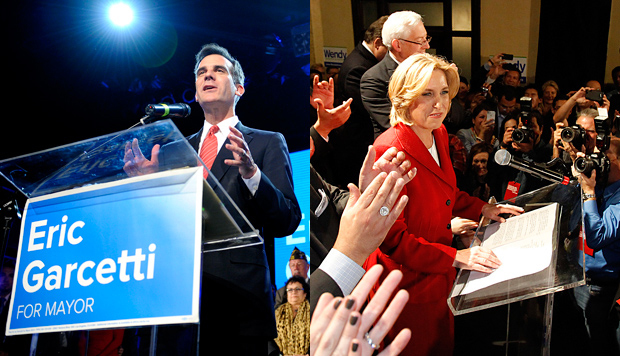 Eric Garcetti (left) and Wedy Greuel will advance to the L.A. City mayoral race in May. According to L.A. City Clerk results presented by the L.A. Times, voter turnout for the primary was “a dismal” 16%, lower than it was four years ago when Villaraigosa ran for his second term. Those who did vote also overwhelmingly rejected a sales tax increase that would have brought the city’s up to 9.5%–a measure designed to help the city’s budget shortfalls–and also decided on six new councilmembers. For full L.A. election results, click here.